Harold N. Morgan, husband of the late Hazel (Strong) Morgan, passed away peacefully on February 9, 2019 at Villa Maria Nursing Home in Plainfield. He was a lifelong resident of North Stonington, CT, residing at 43 Pendleton Hill Rd for almost 60 years. Harold was born on January 14, 1921 in North Stonington, the son of William F. and Edith Louise (Merrill) Morgan. He grew up working on the family farm in North Stonington until after high school. Harold graduated from Wheeler High School in North Stonington. He went to work for C. B. Cottrell & Sons Printing Presses in Westerly in the late 1930’s. In the early 1940’s through the 1950”s Harold was an avid motorcyclist on the road and in the woods riding his Indian motorcycles. He was a member of the New London Motorcycle Club for many years and it is through the club he met his wife Hazel. 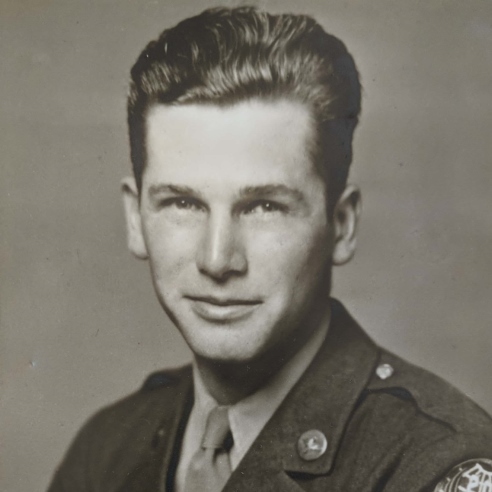 In 1943, during World War II, he joined the Army Air Corp and because of his excellent mechanical abilities he was trained as ground crew mechanic for the new B29 Superfortress. He was stationed on Tinian Island in the Pacific Ocean and was ground crew 1st of “Big Wheel” and then “Heavenly Flower”, until the end of the war in 1945. On his return to the states he went back to work for Cottrell Printing Presses where he worked for many years. After he left Cottrell’s he worked for several other companies, his last being Posi-Seal (Fisher Controls) where he specialized in machine repair, until he retired in 1985. In the 1960’s Harold and his wife Hazel started hiking in the White Mountains of New Hampshire. They led many trips with other family members into the mid 1970”s. After retirement Harold spent much of his time taking care of his old home and outbuildings at his residence. He loved to be outdoors spending time cutting, splitting and stacking firewood to heat his home. For many years he planted and maintained a very large vegetable garden. Harold loved all of his dogs. Over the years he had many dogs and would take great pleasure in having them outside with him “helping” him on his “jobs”. He also loved birds, taking time each morning on his daily walk to make sure they were fed at various places around his 9-acre property. Harold also was a patient teacher spending many hours with his step grandsons teaching them about auto mechanics, electricity, vegetable gardening and the like. Harold was known to be able to fix and repair just about anything and would often help others as well. Quite often when making a repair he would have to check his stock department (aka many boxes of stuff stored in his basement or barn) to see if he had what was needed to make the repair. If he couldn’t find what he needed he would reverse engineer it and make it on his lathe, milling machine, drill press, etc. Harold also enjoyed attending reunions of his Army Air Corp 9th Bomb Group. He and his wife traveled to many locations in the US and as far away as Seattle, WA to attend a reunion. He was a member of the Masonic Coastal Lodge No. 57 in Stonington for over 50 years. Harold is survived by his nieces, Judith (Morgan) Malavazos and her husband George, and Joyce (Morgan) Elias and her husband Charles, of North Stonington, and nephews Timothy I. Morgan and his wife, Marianne, of Westerly; and Elbert L. Morgan Jr. of North Stonington, a step daughter, Christine C. Gillis of Canton, NC, step granddaughter Cheryl G. Murdock and her husband Terry of Uncasville, CT, a step grandson Benjamin A. Gillis Jr. and his wife Laurie of Canton, NC and step grandson Harold M. Gillis and his wife Cindy of Griswold, CT and 5 step great grandchildren and 1 step great great grandson. Besides his beloved wife Hazel, he was predeceased by his parents, and brothers, William F. Morgan, Jr. and Elbert L. Morgan. Funeral services will be held at Buckler-Johnston Funeral Home, 121 Main St. Westerly, RI., Friday, Feb. 15, 2019 at 11 a.m. A calling hour will precede the funeral from 10 to 11 a.m. Burial will be in Union Cemetery, North Stonington, CT following the funeral. In lieu of flowers, donations in his memory may be made to the American Legion, 160 S. Broad St., Pawcatuck, CT 06379 and/or to the Villa Maria Nursing & Rehab, 20 Babcock Ave, Plainfield, CT 06374, who provided him with exceptional care and comfort for the last 7 years of his life.